An elderly lion, saved after a lifetime of suffering in the cold confines of a cage, has been seen offering a remarkable sense of compassion to another creature — something his captors had denied so long to him. Earlier this year, Guero the lion was rescued from a private zoo in Mexico where he'd spent years all alone in confinement, showing signs of psychological and physical torment. The lion's teeth become worn down to nubs from gnawing on the bars that lined his cage. He also had a broken neck that had been left untreated. Death seemed close by the time help arrived. A local animal welfare group was fortunately able to secure Guero's release, after which they contacted The Wild Animal Sanctuary, in Colorado, in hopes of finding him a better place to live. Soon enough, the aging lion was flown to the United States to receive some much needed medical care — and to begin his new life of peace and dignity on the sanctuary grounds. It's only been a few short months since Guero arrived, but the regal big cat has already begun to settle in at his sprawling new home — seeming to relish in the companionship of the sanctuary's other animal residents. Amazingly, despite the cruelty he was made to endure, Guero's heart is still full of love. 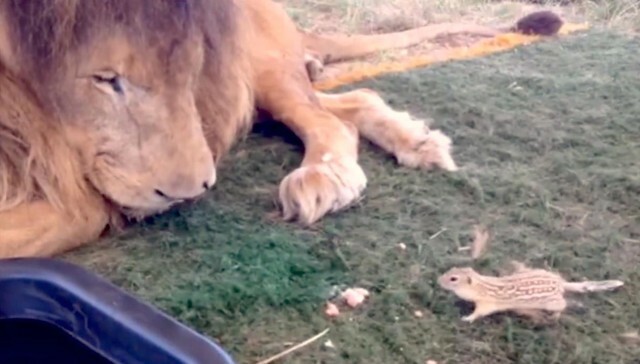 The lion has struck up a sweet little friendship with the most unlikely critter — a squirrel with whom he is happy to share his food. "Every day Güero loves to get a little whipping cream after he finishes his meat, and the squirrel has decided he likes the whipping cream just as much!" the sanctuary wrote on Facebook. "It's been a scene we see repeated more and more often, and we wanted to share the 'sweet' bond they have with you!" Guero has already touched countless hearts around the world as a symbol for the horror of animal mistreatment — but as the final chapter in this old lion's story shows, a king's spirit isn't so easily broken. Video Of The Day! Turns out Güero and the 13 striped Ground Squirrel are buddies and Güero is purrrrfectly fine with the little guy sharing his food. Every day Güero loves to get a little whipping cream after he finishes his meat, and the squirrel has decided he likes the whipping cream just as much! It's been a scene we see repeated more and more often, and we wanted to share the "sweet" bond they have with you! Responses to "Lion Freed From Lonely Cage Makes An Unlikely New Friend"
People who do this to any animal should receive the same kind of treatment. Live on Guero. You are the king !!!!! our treatment of animals is inconsolable.